'L.A. Woman' - 5 CD Super De-Luxe Box cancelled. According to a number of sources the long promised and much awaited 5 disc ‘super de-luxe’ CD box set to mark the 40th Anniversary of The Doors classic ‘L.A. Woman’ has been cancelled by Rhino Records. The release was announced in September with a street date 24th November. Reports are that in these tough times Rhino has decided that it is not a commercially viable project. 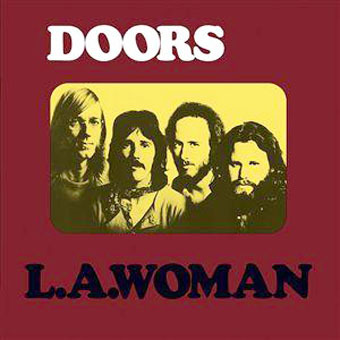 The official Doors online forum says: “there are concerns at their end” (Rhino) and they want to be sure that not only is the market there, but do we have a place to distribute them?” It is being suggested that a cheaper 3 disc set will be available alongside a double CD ‘L.A. Woman 40th Anniversary special edition’. There were and still are an array of different releases of ‘L. A. Woman‘ planned including dvd and Blue-Ray releases. So the double CD 40th Anniversary set is due for release on 24th January 2012, and the proposed 3 disc set will be released at an “affordable price (most likely under $50)” at some point in the first half of the year. Or “definitely in 2012″ according to Jampol. The 3 disc set looks like it will be a ‘limited edition’ of 6,000 numbered copies. There is no track listing for the 3 disc set, except that the tracks will be alternate and outtakes etc from the ‘L.A. Woman’ sessions, all previously unreleased with nothing from the double disc repeated. This entry was posted in Compact Disc, Rare Records, Rock. Bookmark the permalink.